The title itself makes for drab kitsch. A warning at the onset, this film will appeal only to Lego fans… So there are chances that you may either like it or hate it. The narrative takes off from its 2014 edition. During the past five years, Finn’s younger sister Bianca has started taking some of his Lego creations to their basement to play within her own room. Metaphorically, the Lego universe Bricksburg is invaded by Duplo and is now turned into a post-apocalyptic wasteland called Apocalypseburg, where cuteness is unacceptable and brooding is rewarded. While Wildstyle Lucy (Elizabeth Banks) has confirmed to toe the line like the other citizens, brooding just isn’t in the Master Builder Emmet Brickowski’s blood. He attempts to broker peace between the citizens and the aliens with a Lego heart, but to no avail. What makes matters worse is Emmet’s nightmare of “Armageddon”. Meanwhile, General Sweet Mayhem, the leader of the Duplo army arrives in Apocalypseburg and announces his Queen Watevra Wa’Nabi’s (Tiffany Haddish) intention to marry Batman (Will Arnett). So his forces kidnap Batman, Lucy, Unikitty (Alison Brie), Benny (Charlie Day), Metalbeard (Nick Offerman) taking them to the Syskar System. How Emmet rescues his friends and saves the world once again before the impending Armageddon, forms the crux of the narrative. The visual effects and animation along with the voices lent by the ace cast are first rate. 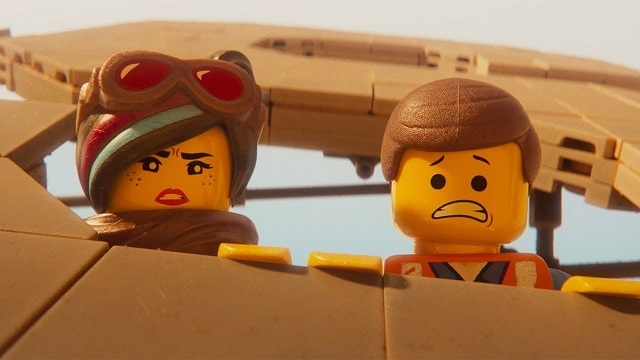 You may like this film because the Lego Universe appeals to you as you are a Lego fan, there is enough humor in the whacky one-liners that poke fun at heroic cliches to keep you entertained. And, you like motivational lessons, convoluted stuff, and remixed numbers. You may hate it because this fourth installment of the Lego franchise, where everything is supposed to be “awesome”, just feels jaded. The magic that drove the first film just feels missing from this installment. The motivational lessons appear contrived. The visual gags appear monotonous and uninspired. The plot is complex and clunky. And, the final act is messy and convoluted with illogical time travel sequences. But overall, “Lego Movie 2: The Second Part” isn’t a bad film, by any means. It’s just that you can’t help but compare it to its predecessor.